Governor Larry Hogan and Lt. Governor Boyd K. Rutherford were sworn in for a second term in office today in an inauguration ceremony at the Maryland State House. 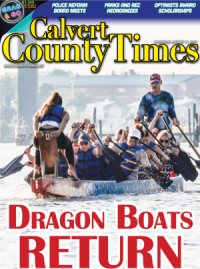 ANNAPOLIS (January 16, 2019)—Beating non-Hodgkin's lymphoma into remission and being the first Maryland Republican governor elected for a second term since 1954 is no small feat. Regardless, Hogan has previously touted his bipartisanship, and Wednesday's inauguration was no different. Hogan said after his swearing in that in this term, he plans to continue the harder work of putting the people's priorities before partisan interests. "Do the right thing, and the politics will work itself out," said Hogan. Much of Hogan's speech took jabs at the federal government's inability to compromise. "Heat, finger-pointing and rancor suffocates the light," said Hogan. "That's not politics, that's political theater." "I still believe that what unites us is stronger than what divides us," Hogan said. Hogan signaled his willingness to reach across the aisle by having Isiah "Ike" Leggett, former Montgomery County executive, make the opening statement. "This inauguration is not an ordinary event," Leggett said. "It is the official recognition and acceptance of the people of Maryland." Jeb Bush, 2016 GOP candidate and former governor of Florida, said Hogan's governance contrasted the gridlock and dysfunction in Washington. "There's not a lot of people I would leave paradise for," said Bush, referencing warm weather in Florida, "but Larry Hogan is at the top of that list." In standing by one of President Donald Trump's former Republican rivals, Hogan further distances himself from the conflict between parties on Capitol Hill. Kaiser told Capital News Service that over the last four years, Hogan "advanced our agenda or signed off on it at the end, and claimed it as his own." Kaiser said she is curious to see what Hogan's vision for the next four years will be, but said the House will provide for the working class no matter his plans. Even with a House and Senate with the power to veto his decisions, Hogan still holds a 67.3 percent favorable opinion among Marylanders, according to an October 2018 Gonzales poll (www.realclearpolitics.com/docs/Gonzales_Maryland_Poll_-_October_2018.pdf). Queenstown, Maryland, resident Michael Parsons, 49, a Republican, said Hogan is "one of the most likable politicians you'll ever meet." Jay Walton, 37, a Republican from Dundalk, Maryland, said he was particularly impressed by Hogan's steps toward improving education. "He's trying to hold education officials more accountable," said Walton. Walton was just appointed to Hogan's P-20 Leadership Council of Maryland, a schools-business partnership that aims to prepare students entering the workforce. "You can't get anything done if you're not for everyone," said Craig. Michele Cordle, 58, a Republican from Annapolis, Maryland, said it is Hogan's ability to put aside partisanism that makes both Republicans and Democrats love him. 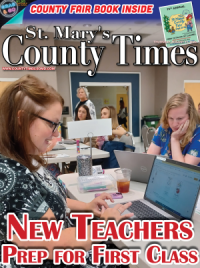 "He has some challenges, but like anything that Larry faces, he's going to take on the challenge," said Cordle. It is such an honor to be standing here at this historic state house where General George Washington resigned his commission as commander of the Continental Forces and where the Revolutionary War ended with the ratification of the Treaty of Paris. And it is truly humbling to be inaugurated for another term as only the second Republican to do so in the entire 243-year history of our state. 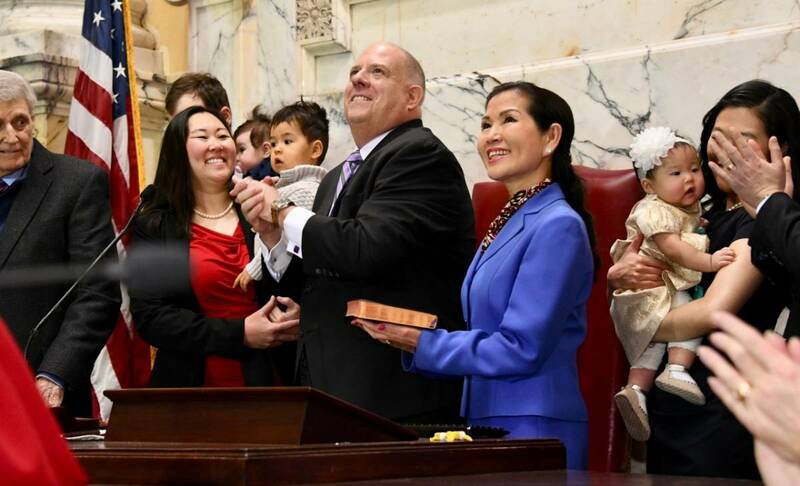 I want to congratulate my friend and partner, Maryland's great lieutenant governor, Boyd Rutherford, and thank my wife, Yumi, who has been a wonderful first lady for Maryland. I would not be here today without the love and support of my entire family. President Miller, Speaker Busch, and all our distinguished guests, thank you for being here. Governor Bush, I'm honored by your presence here today. Your governorship was a model of leadership, and your entire family has been a shining example of public service. Last month, I had the privilege of attending the memorial services for your father, our 41 st president, a true American hero who represented the very best of our nation. Throughout his remarkable life, he showed us the true meaning of honor, integrity, courage, and humility. As I listened to your brother, our 43 rd president, deliver his beautiful eulogy, I could not help but think back to just the year before when I lost my own dad and had the difficult job of delivering his eulogy. He served on the House Judiciary Committee during Watergate as the whole world watched the impeachment proceedings. Despite tremendous political pressure, he put aside partisanship and answered the demands of his conscience to do what he thought was the right thing for the nation that he loved. "Party loyalty," he said, "and personal affection and precedents of the past must fall before the arbiter of men's actions: the law itself. No man, not even the President of the United States, is above the law. For our system of justice and our system of government to survive, we must pledge our highest allegiance to the strength of the law and not to the common frailties of man." With those words, my father became the first Republican to come out for the impeachment of President Richard Nixon. The decision cost him dearly. He lost friends and supporters and his party's nomination for governor that year. But it earned him something more valuable: a quiet conscience and an honored place in history. I learned a lot about integrity and public service from my dad. I miss him a lot, especially today. And as I look out at all of you, the backdrop is the beautiful dome of the United States Naval Academy chapel where I attended the funeral of another American hero, Senator John McCain, a man with passion, toughness, and tenacity. Senator McCain wasn't someone who would yield easily, but he never hesitated to reach across the aisle to get things done, and he always put his country before his party or himself. As we look back on the lives of these leaders, it makes us yearn for something better and more noble than the politics of today. For those of us who have been given the privilege of serving, we could offer those men no greater tribute than to follow their example. Back in January of 2015, I was humbled, eager, and, frankly, a little awed by the opportunity granted me by the people of Maryland to serve them as governor. In the incredible four years that followed, there has not been a single day, good or bad, when I was not grateful for the privilege. Thank you, my fellow Marylanders, for giving me the most important work of my life. Because of the trust that you have placed in me, I pledge to you that I will keep giving this job everything I've got every single day that I am given. Four years ago, I committed to usher in a new era of bipartisan cooperation and prosperity in Maryland, one filled with hope and optimism. I pledged to govern with civility and moderation, to avoid attempts to drive us to the extremes of either political party, and to uphold the virtues that are the basis of Maryland's history as "a state of middle temperament." I believe it's because we kept that promise to put problem-solving ahead of partisanship and compromise ahead of conflict that I'm standing here again today just as humbled and eager and awed as I was at the start of my first term. We have spent four years working together to unshackle the unlimited potential and promise of this great state. We debated, discussed, and reasoned together honestly and productively, with integrity and sincere purpose. We argued without acrimony, negotiated without hidden agendas, and compromised without political posturing. We didn't demand Republican solutions or Democratic solutions; we sought out bipartisan, commonsense solutions that worked for the people of Maryland. We didn't surrender our principles; we simply practiced the art of the possible, and we trusted Marylanders to appreciate the distinction. Do the right thing and the politics will work itself out � that was our plan. We faced our fiscal challenges with steady resolve and eased the tax burden on hard-pressed Maryland families, retirees, and small businesses. We funded education at historic levels to give our schools the resources needed to prepare our children for the opportunities of the future. We protected the healthcare coverage of Marylanders and provided lower insurance rates for the first time in a decade. We met our transportation challenges head on with historic investments in our infrastructure. And we practiced skilled stewardship of the environment, which resulted in a Chesapeake Bay that is cleaner than it has been in recorded history. Today, I ask my partners in the legislature to join in reaffirming our pledge to continue on this bold new path. Rather than engaging in mere rhetoric, let's continue to deliver real results for the people who sent us here. Let's keep putting the people's priorities before partisan interests. Let's continue to tackle our common problems by accepting our shared responsibility to solve them. Let's repudiate the debilitating politics practiced elsewhere � including just down the road in Washington � where insults substitute for debate, recriminations for negotiation, and gridlock for compromise; where the heat, finger-pointing, and rancor suffocates the light, and the only result is divisiveness and dysfunction. Where getting something done for the people no longer seems to be a priority. People on both sides of the aisle refuse to give up even a little to get a lot done. Neither side really wants to make progress; they just want to make demands and win arguments. That's not governing � that's just political theater, and most of us are sick and tired of all that drama. Look, I'm willing to stand up and fight for the things that really matter but not for status quo politics and not to perpetuate polarization and paralysis. I come from the get-to-work and get-things-done school of politics, and I'll work with anyone who wants to do the people's business. We have enough worries, stress, and drama in our private lives, don't we? We might have a sick child or an elderly parent to care for; problems at work or in school; a spouse who lost a job; or a close friend who's hurting. Maybe we received a tough diagnosis or recently lost someone we love. We all suffer enough challenges in our lives that give us plenty to worry about. You shouldn't have to obsess over or argue constantly about angry and divisive politics. You should be able to have confidence in the character and competence of the people you elect to office regardless of their party affiliation. You should be able to trust that we'll do our best for you to solve our problems. Those of us blessed by your trust should give you a government that doesn't act as if it is something apart from you but one that is of the people, by the people, and for the people. A government that appreciates that no one of us has all the answers or all the power. A government that tolerates contrary views among a diverse citizenry without making them into enemies or doubting their patriotism. A government that can discuss and debate with as much civility as passion and with a view to persuade, not intimidate, to encourage, not demonize or defeat. A humble, tolerant, respectful, and effective government that has worked together and found bipartisan, commonsense solutions. A government that took on the big problems and made things better for the people we serve. A government we could all be proud of. As I stand here today, I'm hopeful, and I have every confidence in our collective ability to continue giving Marylanders a state government that is just as decent, hardworking, and pragmatic as they are. Harry Truman once said: "Men make history, not the other way around. Progress occurs when courageous, skillful leaders seize the opportunity to change things for the better." It isn't always easy to put the public good ahead of personal and partisan interests. If it were, then leaders like George H.W. Bush, John McCain, and my dad would not have stood out from their contemporaries as much as they did. Those men had the wisdom to know that no success is more satisfying than living honorably and keeping faith with the people who gave you their trust. While the tenor of today's national politics may have strayed from the noble example they set, I still believe that what unites us is greater than that which divides us. And to those who say our political system is too broken and can't be fixed, I would argue that we have already shown a better path forward. And if we can accomplish that here in Maryland, then there is no place in America where these very same principles cannot succeed. So on this historic day, in this historic place, let us once again pledge to seek that middle ground where we can all stand together. Let's keep changing Maryland for the better and continue setting an example for the rest of the nation. And may God bless the great State of Maryland and the United States of America.